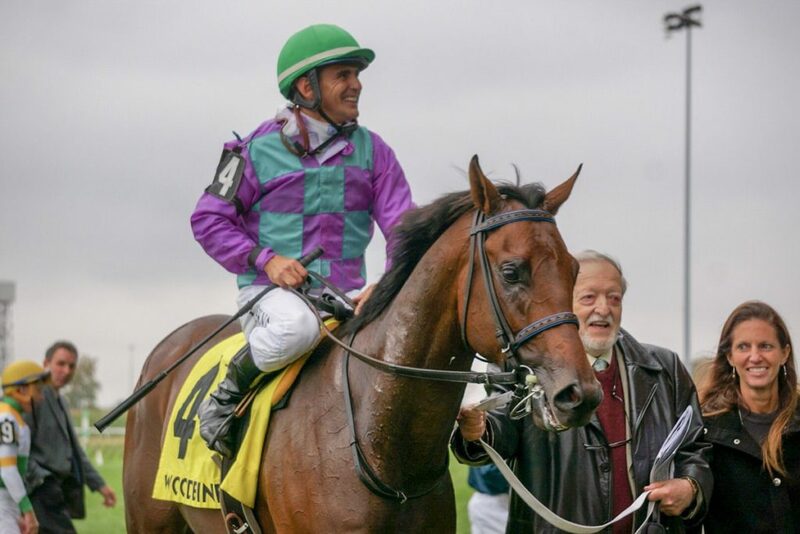 The Jockey Club of Canada released the finalists for the 2018 Sovereign Awards Thursday evening, honouring Canada’s Champions and recognizing their outstanding achievements in Canadian Racing. The winners of the twelve horse categories and the five human categories will be announced at the 44th Annual Sovereign Awards Ceremony on Thursday, April 18, 2019 at Chateau Le Jardin in Woodbridge, ON. CHIEFSWOOD STABLE, owned by Robert and Mark Krembil of King City, had a very strong 2018 season in Canada and it is up for Outstanding Owner and Breeder while 6 of its homebreds are nominated in various categories. TIZ A SLAM, a son of Grand Slam, is up for Champion Older Male and Champion Turf Male and was a 2-time graded stakes winner at 4 last season winning the Grade 3 Dominion Day and Grade 2 Nijinsky Stakes on turf. He was also 2nd in the Grade 3 Sky Classic and 3rd in the Grade 2 fair Grounds Handicap. His main competition in both those categories is Sean and Dorothy Fitzhenry’s Mr Havercamp. also a double graded stakes winner on turf and synthetic in 2018. Chiefswood’s 2-year-old filly BOLD SCRIPT, 3-year-old colt NEEPAWA, turf female NIIGON’S ECLIPSE and sprinter YORKTON are also nominated. Toronto’s IVAN DALOS, who has built up one of the most potent breeding operations in Thoroughbred racing in Canada is nominated for Outstanding Owner and Breeder while 5 horses he owns or bred are also nominated. His 2-year-old colt AVIE’S FLATTER is the likely winner of Champion 2-year-old Colt, GAMBLE’S GHOST is nominated for Champion Older Mare, JOHNNY BEAR (owned by Colebrook and Bear Stables) is up for Turf Male and two Dalos broodmares, the late IN RETURN and AVIE’S EMPIRE are up for Outstanding Broodmare. Dalos mares have won the last 2 Outstanding Broodmare awards. Western Canada is well represented as Manitoba Horse of the Year ESCAPE CLAUSE is up for Older Mare and Female Sprinter. SKY PROMISE is up for Champion Three-Year-Old Colt and HERE’S HANNAH made the short list for Champion Three-Year-Old Filly. The HORSE OF THE YEAR finalists will be announced on the night of the ceremony but is sure to include WONDER GADOT, the shoo-in for Champion Three-Year-Old Filly who won the Queen’s Plate and Prince of Wales and was a close 2nd in the Grade 1 Kentucky Oaks (G1). Wonder Gadot’s dam Loving Vindication is up for Outstanding Broodmare but in a surprise, David Anderson’s Anderson Farms did not make the top three for top Breeder. There are other double-nominees including PINK LLOYD, last year’s Horse of the Year who should be named Champion Sprinter, STARSHIP JUBILEE, last year’s Female Turf champ, DIXIE MOON and MR HAVERCAMP. 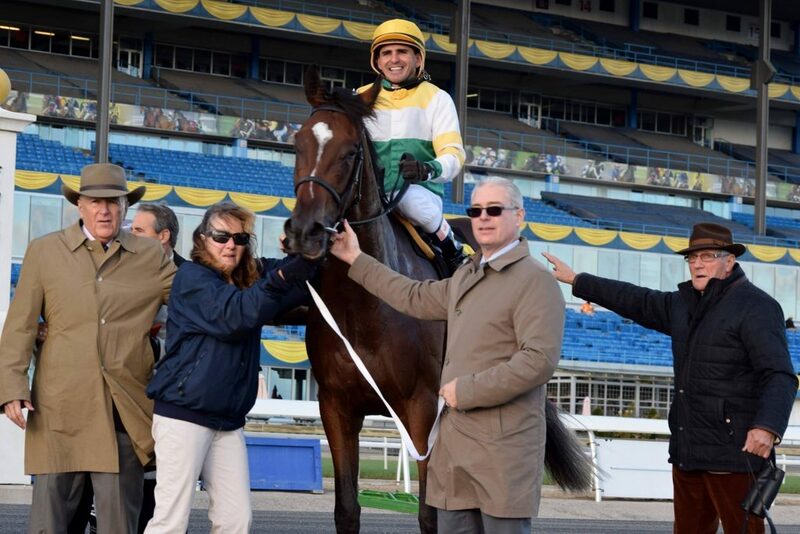 The Outstanding Trainer Sovereign should be hotly contested between NORM MCKNIGHT, MARK CASSE and KEVIN ATTARD. Casse has won the award 7 straight years and 10 times in total. Thoroughbloig’s ballot can be found here. Tickets to the 44th Annual Sovereign Awards Ceremony are available for purchased online. Tickets are $250 each, with tables of ten discounted to $2,000. Early-Bird tickets are available for a discounted price of $225 until March 15, 2019. You can also purchase tickets by contacting The Jockey Club of Canada at 416-675-7756 or by email jockeyclubcanada@gmail.com. Large carryover jackpot bets lure fans to horse racing wagering. And wagering fuels purses. The Pick 6 at Santa Anita is charging to a wonderful mandatory payout on Saturday as the bets carryover stands at $1.5 million following Thursday’s racing. The bad news is, the weather has been dreadful on the west coast and yesterday, the track was sloppy and fields were very small. Should there be no single winner of the Pick 6 today, fans will get a chance to play the mandatory payout on Saturday which the track estimates will be over $10 million and there are a few nice stakes races on the card. In a key prep to the $1 million Santa Anita Derby April 7, Jerry Hollendorfer’s Gunmetal Gray and Bob Baffert’s Mucho Gusto head a field of six sophomores in Saturday’s Grade III, $150,000 Robert B. Lewis Stakes at 1 1/16 miles. Gulfstream has a carryover of almost $1 million heading into today but does not have a mandatory payout on the docket as of yet. The track also has some nice stakes races on Saturday. Gulfstream’s 3-year-old stakes race is the popular Holy Bull Stakes (G2) which could be a pivotal stop on the Road to the $1 million Xpressbet.com Florida Derby (G1) at Gulfstream Park, where the Triple Crown potential of many starters will hinge on how they handle the two-turns of the 1 1/16-mile stakes for 3-year-olds. Canadian-bred COME ON GERRY (Elusive Quality – Halo’s Verse), foaled at Anderson Farms, is making his stakes debut against a tough field. Trainer Robert “Butch” Reid Jr. will saddle Maximus Mischief for the Holy Bull with the confidence the son of Into Mischief won’t be sidetracked on the Triple Crown trail by distance limitations. 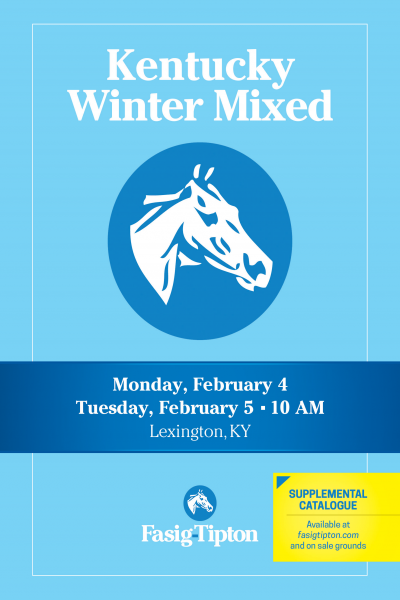 While others in the field will be stretching out around two turns for the first time in the Holy Bull, Maximus Mischief will actually be cutting back in distance for his 2019 debut. Owned by Chuck Zacney’s Cash is King LLC and Glenn Bennett’s LC Racing, Maximus Mischief was purchased for $340,000 at the 2018 Fasig-Tipton Midlantic 2-year-olds-in-training sale. The Kentucky-bred colt paid immediate dividends with a dazzlingly 8 3/4-length triumph in his Sept. 29 debut and a six-length victory in a seven-furlong first-level allowance Oct. 20. His two Parx showings earned him a trip to Aqueduct for his stakes debut in the Remsen, in which he set the pace and drew off in the stretch. 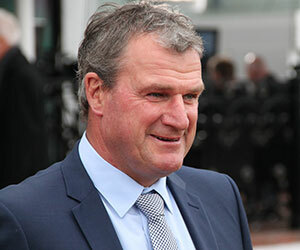 The raid and subsequent arrest and charges to one of Australia’s top trainers Darren Weir and Jarrod McLean has rocked horse racing around the world. The sport, which has struggled with public perception from the use of the whip to rumours of drug use, has been on shaky ground in Australia for some time and the Weir story is very damning. One of Australia’s most respected veterinary surgeons says the future of Victorian racing is under threat following this week’s alleged discovery of electronic devices known as “jiggers” on a racing property. Dr Glenn Robertson-Smith claims the alleged discovery of the “go fast” devices has set Victorian racing back decades and fears dramatic consequences unless Racing Victoria show strong leadership and sends a message that this behaviour will not be tolerated.